Door Installation Kansas City: Do You Need a New Door? Your home’s appearance makes a statement, and you want it to be a statement that you’re proud of. From your exterior coat of paint to the windows you’ve chosen, your friends, family, and neighbors will all notice your design choices. While they’re easy to forget about, the doors with which you furnish your home can significantly add, or detract, from its beauty. 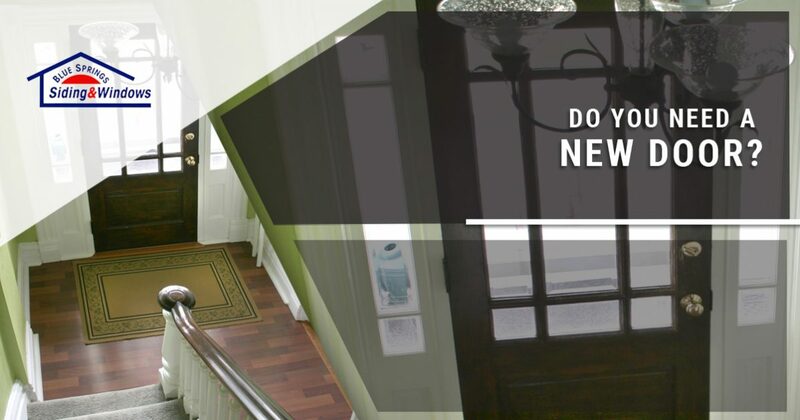 If you’re looking for a low-cost way to update your home’s appearance while increasing its overall value, then you should consider a new door installation for your home! At Blue Springs Siding and Windows, we proudly offer a number of door installation options that can help your home become the welcoming space of your dreams. Read on to learn more about our door installation options, and contact one of our friendly team members for a free estimate! While your home’s landscape, siding, and decor will all be noticed by passersby, it’s your entry door that your friends and family will be looking at when they arrive at your home. We know that you want your entry door to impress everyone who sees it, and we offer a variety of entry door installation options that can provide you with the entryway you’ve always wanted. Whether you’re looking for a great new door with patterned windows or a rounded door in the color of your choosing, our showroom has options for every style and budget. If you’ve recently purchased a new entry door, or if you’re looking for a way to protect your current entry door, then you should consider investing in a new storm door. 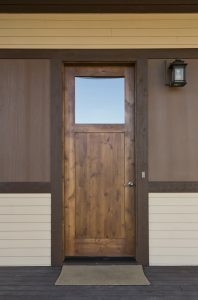 A storm door is a protective outer door that protects your entryway from the weather, intruders, and wildlife. Storm doors are available in a variety of styles and colors, and you can customize everything from the glass panels to whether or not your new storm door has a screen. With the hottest days of the summer just around the corner, you’ll love having the freedom to open your entry door and let the breeze flow through your home without worrying about insects entering your home. With the cold days of winter behind us, you’ve probably taken your patio furniture out of storage and fired up the grill once or twice. Whether you’re the neighborhood’s go-to pitmaster or you enjoy having a few friends over for a nice outdoor dinner every weekend, a well-tended patio is the perfect way to create a warm and welcoming atmosphere for your guests. The furniture and decor of the patio itself are important elements, but you should consider that your patio door will be seen by guests as they enter and exit your home. At Blue Springs Siding and Windows, we offer several patio door installation options that can help you create the perfect entertainment space. Whether you’re looking for a hinged patio door with glass panels that allow you to look out into your garden, or a picturesque sliding patio door that frames your entire backyard, you’ll find the perfect new door for your space at Blue Springs Siding and Windows. We hope that this post will help you find a new door that is perfect for your home. If you’re interested in learning more about our door installation options, then come by our showroom in Blue Springs or get in touch with us at 816-629-6270 . We offer lifetime warranties on all of our products and services, giving you the peace of mind you need to make an investment in your home. We look forward to speaking with you soon!